Wow - did you just love the Western Christmas peeks yesterday! Thanks for all of your lovely comments left. 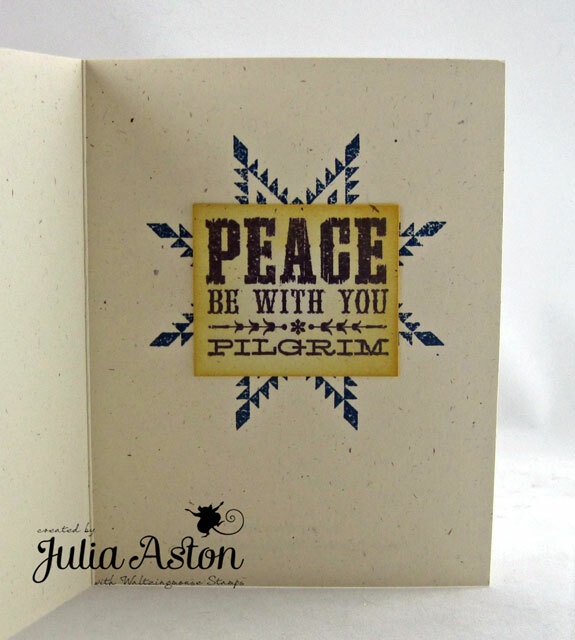 Today we're moving right along to two more of the Waltzingmouse November Release sets - Compliments of the Season - Two, a small set of 7 sentiments in varying sizes - and Vintage Christmas Background. 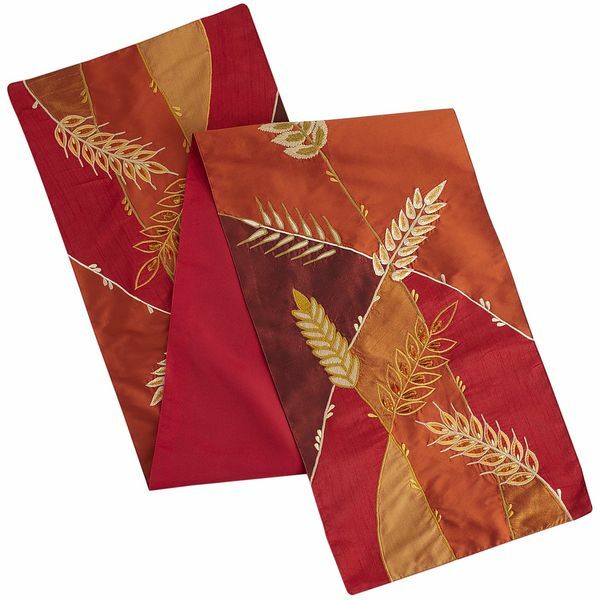 Many of you probably already have last year's Compliments of the Season set - so this will be a wonderful addition for you! For some reason I immediately thought Silver and Blue with these stamps - so that's what I used for my peeks today! First, the card - I silver embossed this beautiful Vintage Christmas Background stamp on Enchanted Evening card stock. 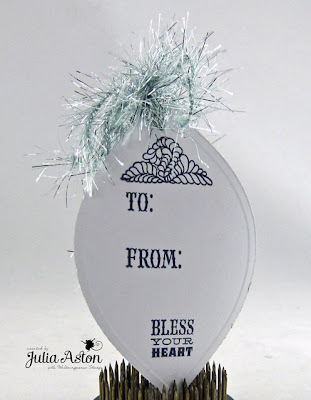 Then I silver embossed this wonderfully ornate sentiment on the same color. 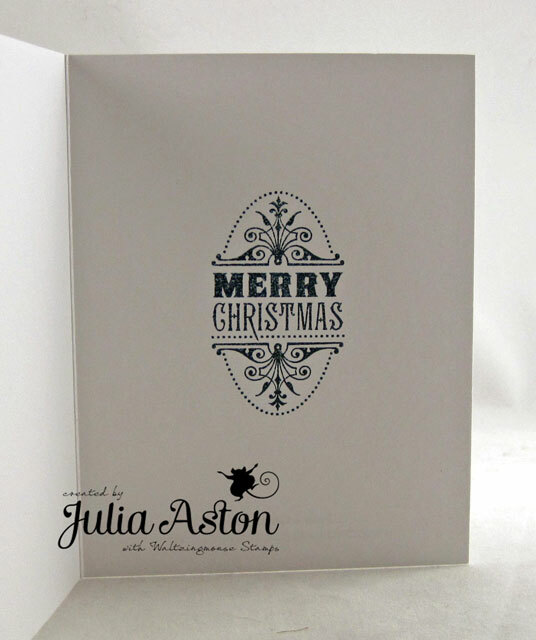 I layered both to Pewter Mirror Paper. I adhered the sentiment to the background with foam tape and layered them both onto the white card base. Then I added little silver pearls to several spots on the sentiment and larger ones to the bottom corner. 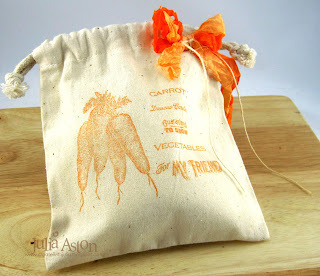 Here's what I stamped inside - Don't you love the pretty design and fonts on this!?! 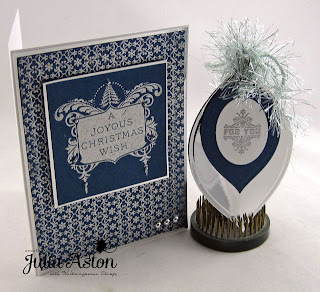 Next I made a little ornament gift tag using the same blue and silver papers. 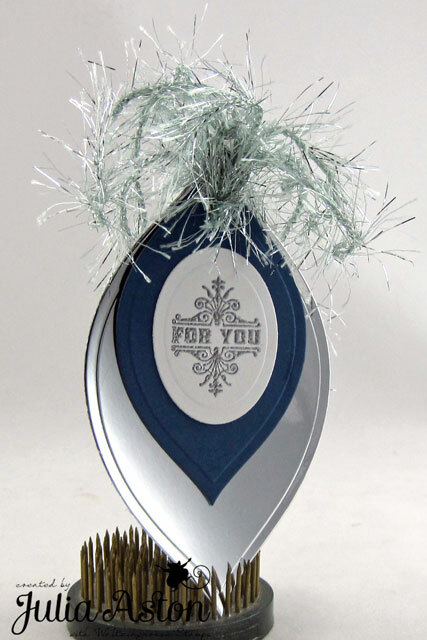 I simply layered two sizes of the 2012 Heirloom Ornament Spellbinders dies - one silver and one blue - punching a hole through the tops and looping this fun silver/blue Glitter Eyelash yarn through the holes. I silver embossed this smaller sentiment from the set, cut it with an oval Nestability and layered it to the blue ornament. 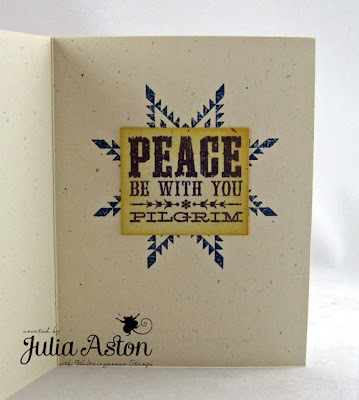 Here's what I stamped on the back using stamps from yesterday's peeked set - Yonder Star. 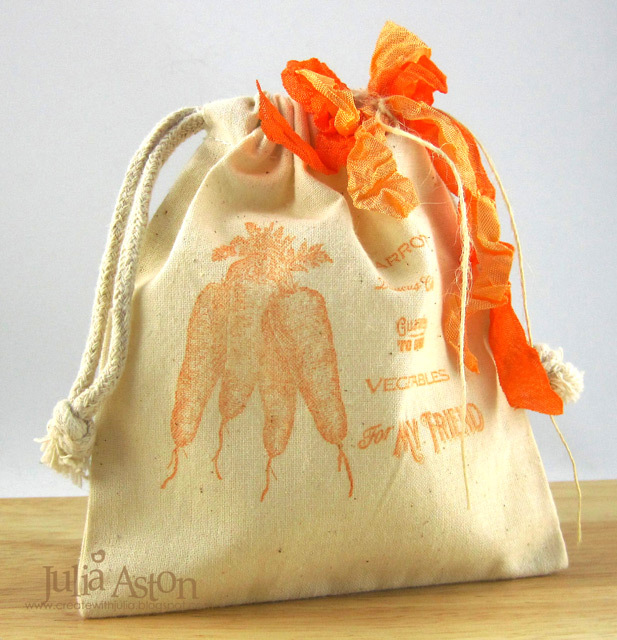 Wouldn't this look lovely on a Holiday gift?! Once again - let's go around and see what the rest of the Design Team has created with these two pretty sets! We'll be having Day 3 of the peeks tomorrow! Hope you can stop by again! Which sets are your favorites so far? Accessories: hot gun, silver embossing powder, foam tape, silver pearls - Michaels, 2012 Heirloom Ornament dies - Spellbinders, glitter eyelash yarn - Martha Stewart, Oval Nestabilities. 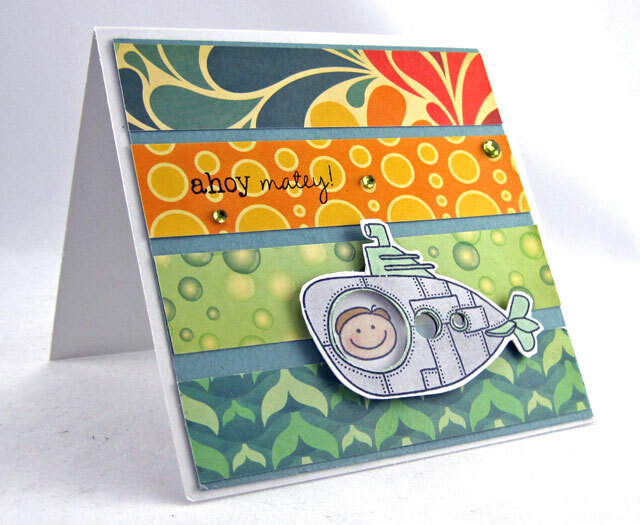 Welcome to the 1st day of the Design Team Sneak Peeks for the November Waltzingmouse Release! 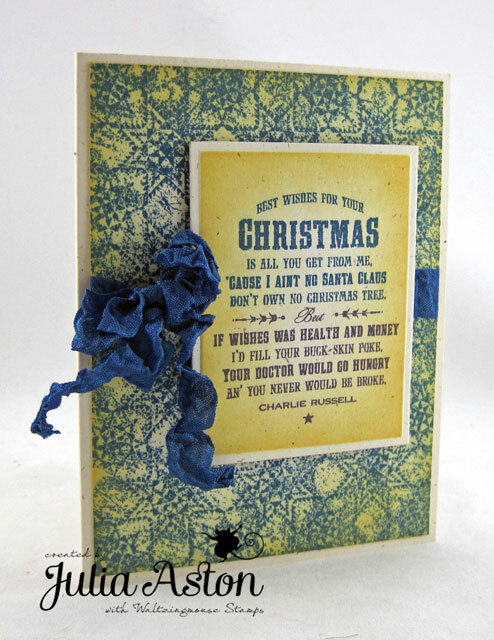 Today we are previewing a wonderful Cowboy Western Christmas Holiday Set called Yonder Star and a coordinating Yonder Star Background stamp! 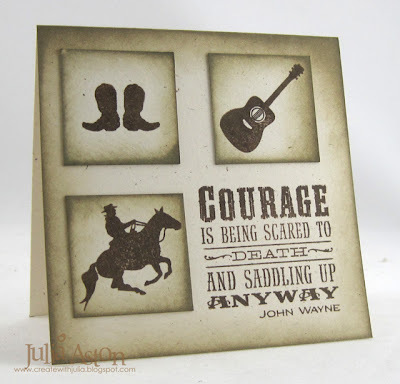 This set is perfect for cards for all those cowboys and cowgirls in our lives - it includes 7 sentiments, 2 large stars that look very much like quilt stars, two small stars, a To: and From: a pretty leafy triangle and the word Joy - for endless creativity! In case you are wondering - Charlie Russell was an artist who painted the old American west and this was one of his Christmas card messages - you can see his info on Wikipedia here. 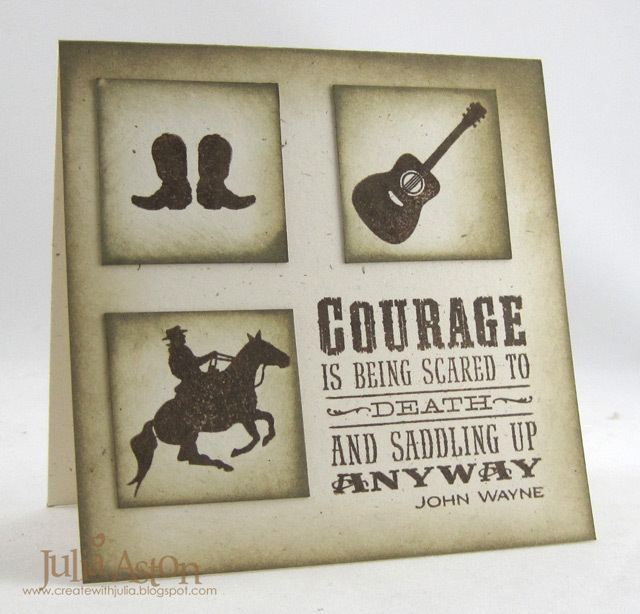 I cut the sentiment with a rectangle Nestability and sponged it with Scattered Straw before taking it out of the die. 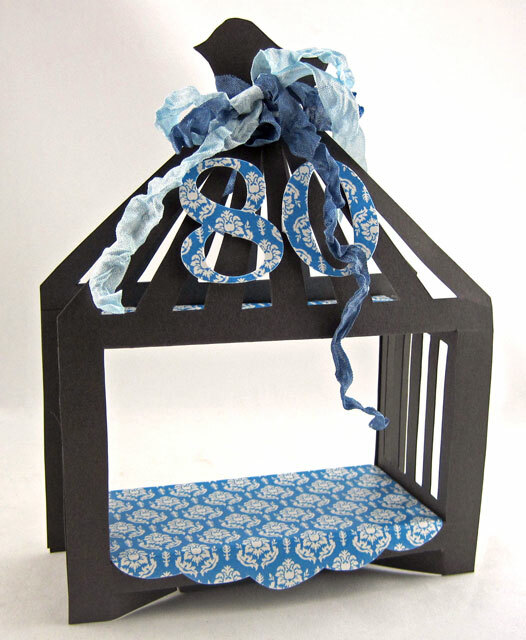 I stamped the background on a separate panel in Nautical Blue and sponged the edges with Scattered Straw. I tied the wrinkled seam tape around the panel, layered the sentiment over the ribbon with foam tape and layered it all on the card base. Inside I stamped one of the two stars in this set (they look like quilt designs!) and layered another of the sentiments over the star - sponging those edges as well. Let's go take a peak at what the rest of the Design Team has created with this set! Here are the links! Please stop by tomorrow for Day 2 of the Sneaks!! Accessories: Wrinkled Seam Tape - Prairie Bird Boutique Etsy Shop, rectangle Nestability, foam tape. 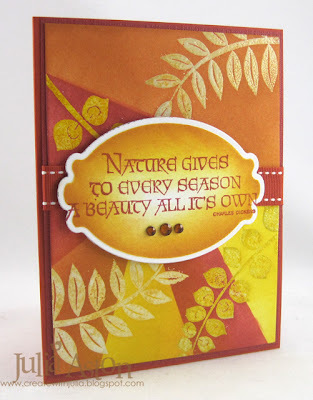 For this fall card, I combined another HYCCT challenge - to use the stamp kissing technique with this week's sketch over at Split Coast. 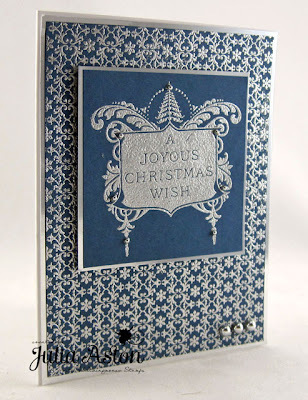 For my 'kissing' I used a solid leaf stamp and a gingham background stamp - both from Waltzingmouse. First I inked up the leaf with Peanut Brittle - then I inked the gingham background stamp with one of the darker colors listed in my supplies below. 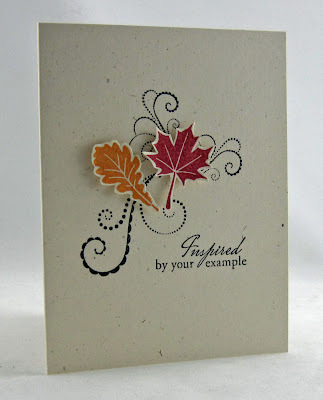 Then I 'kissed' or pressed the stamps together - and when I stamped the leaf on the cardstock - it had the gingham on it! 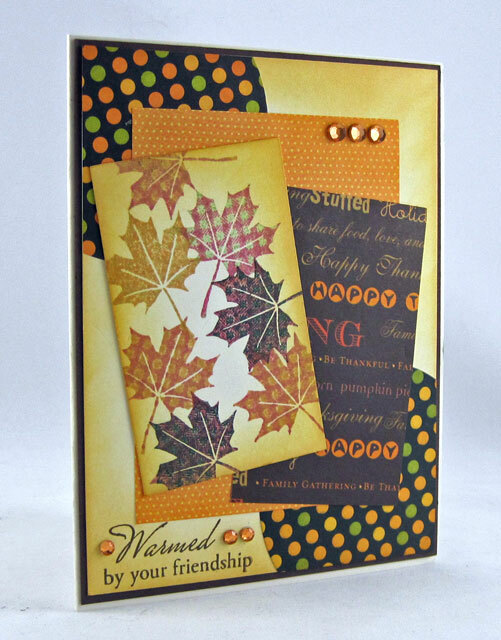 I used 3 different patterned papers from the DCWV Fall Stack for the panels. I sponged the leaf panel and the base panel with Ranger Distress Scattered Straw and added some rhinestones. This busy sketch was a challenge for me as I'm more of a CAS girl at heart but I think I got it done! 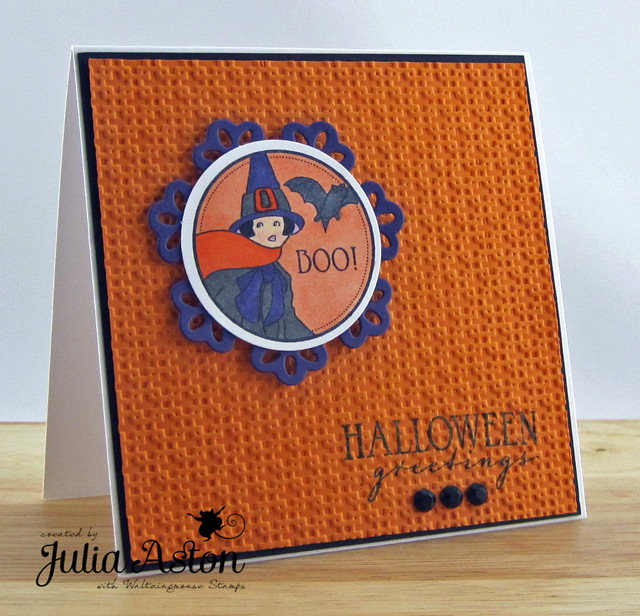 Remember to check out Claire's blog - she's sneak peeking the Nov Waltzingmouse Release! The Design Team will start their peeks on Tues Oct 30th so be sure to check back! I punched the windows out of the submarine and layered acetate behind them. I stamped the face, layered it to the card and adhered the sub over the face with foam tape. I also used clear green rhinestones. These cutie pie stamps are from Half Pint Heroes from Waltzingmouse. 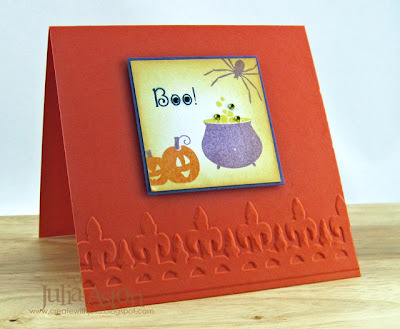 Be sure to check out Claire's blog for her daily sneak peeks for the November Waltzingmouse Release! The Design Team will start their sneak peeks on October 30th and the new release will be on Nov 2nd! You'll love her new sets! I made this card for Taylor's SCS Hope You can Cling To challenge - Two Times - to use two of same thing but different.... I used two leaves: an oak and a maple, two colors: red and orange, and two different flourish stamps. I just love how this came out, if I do say so myself! Be sure to check out Claire's blog for sneak peeks of the November Waltzingmouse Release! The Design Team will be starting to post our sneak peeks on October 30th. 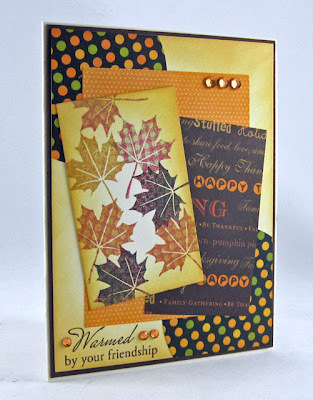 Stamps: Waltzingmouse - leaves and sentiment from Blessed by You, flourishes from Flourishes and Dots. SUSANNA BOYD, Paper Crafts Planet Founder! 3 PRIZES of $20, $10 and $5 Gift Certificates to Creations by AR! This month Adela has created a wonderful Dessert Cage template. Now I know Susanna isn't 80 years old!! but a friend of mine at church is - and her daughters are having a surprise party for her today and I was invited to attend. I wanted to to give her a little something special to mark this special occasion. 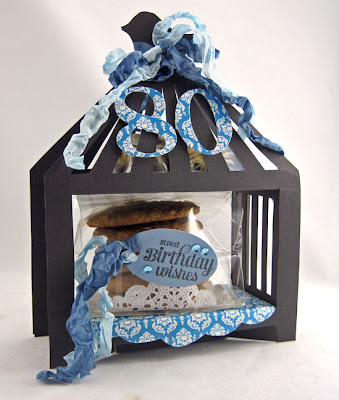 I made my Dessert Cage out of Smokey Shadow card stock to look like the black metal dessert trays I've seen in stores. 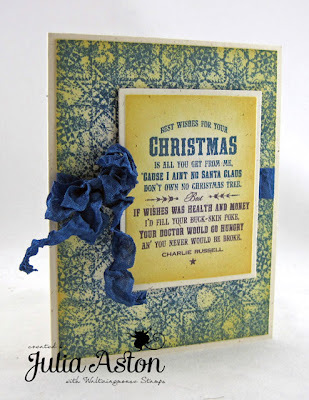 I used pretty blue papers from Amuse and wrinkled seam tape to dress it up. Here's how the Dessert Cage looks empty. 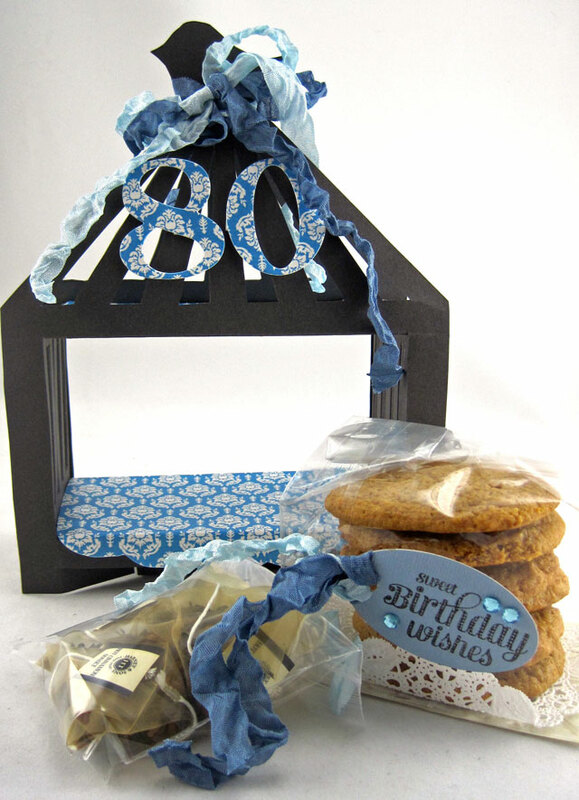 Adela has made such a fun design - it has two levels to put treats on and is quite sturdy when you make it from heavy card stock (I used paper from Papertrey Ink). I used the PDF file (also comes in SVG and DXF) and I cut all the pieces out with scissors and my xacto knife - it didn't take me very long and was easy to do. I made some Pumpkin Spice Cookies to place on the bottom shelf of the Dessert Cage and put some Hot Cinnamon Tea Bags on the top layer. 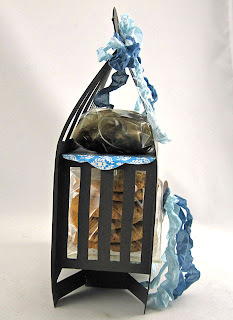 Here's a side view with the Dessert Cage filled with my goodies for Doris. I die cut a Spellbinders tag and stamped 'Sweet Birthday Wishes' from Waltzingmouse on it. I die cut the numbers with dies from Papertrey Ink. 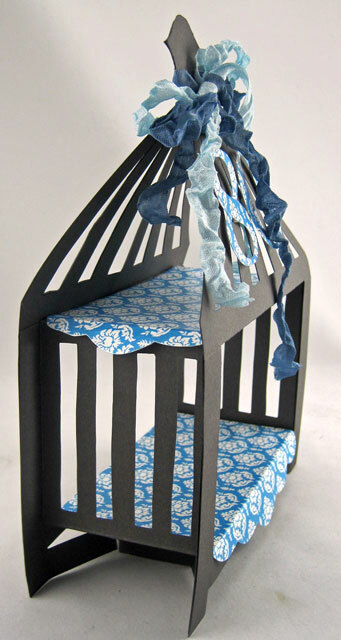 • Visit each Creations by AR Design Team member and leave a comment at each blog. 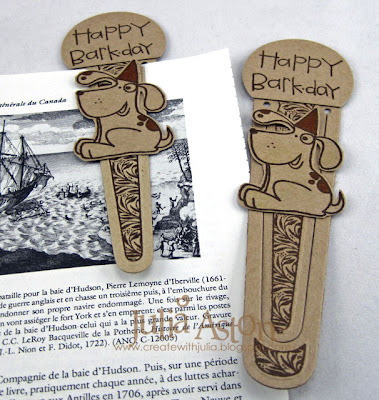 leave a comment at the AP PCP group with a BIRTHDAY WISH for SUSANNA! Comments will also be accepted in the Creations by AR Page on FaceBook for an extra chance at the drawing for prizes! "Like" us if you haven't already! A quick post tonight (I guess it's actually early morning now!) - I'm working at my church fair Friday and Saturday - 2 friends and I sell our cards and stamped crafts at a table each year at our fair - so I had to sneak this card in before I dropped into bed. The little girl and Birthday girl sentiment are from My Balloon set by MFT. The 'Hi!' is from Free Spirit Sentiments by Waltzingmouse. 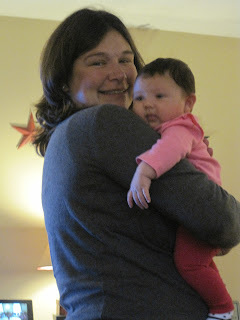 Today I'm excited to be joining the WMS Blog Party - which happens the 17th of each month! 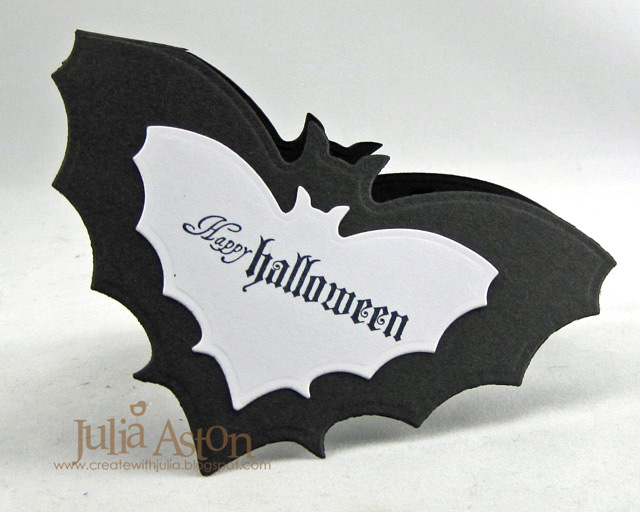 On the first of each month, Lynn announces the theme of the party over at the WMS blog so we have plenty of time to create our cards! I used stamps from Cicely at Halloween - the fun little set with the beautiful Cicely (companion to Gracie at Halloween - another cute witch set!) Cicely is colored with Copics and framed by a Floral Doily Motif Nestability. 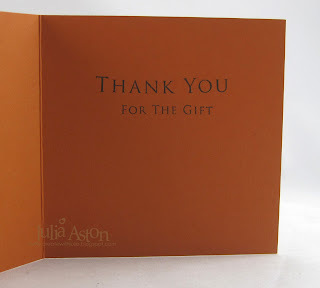 I embossed the orange panel with Square Lattice by SU. 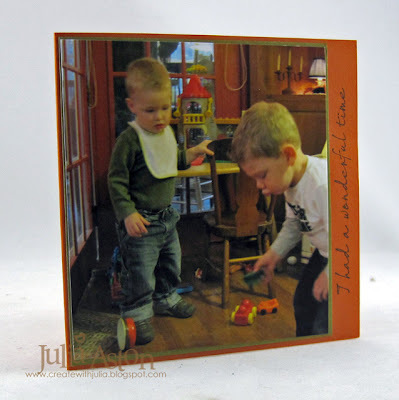 My card is 4 1/4 x 4 1/4 - my favorite size! On the inside I stamped this vintage poem and pumpkin from the Cicely set. 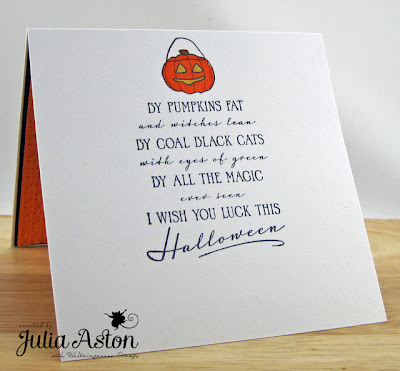 You have until 1:30 pm EST Thursday 10/18 to link up your card at the WMS blog here. 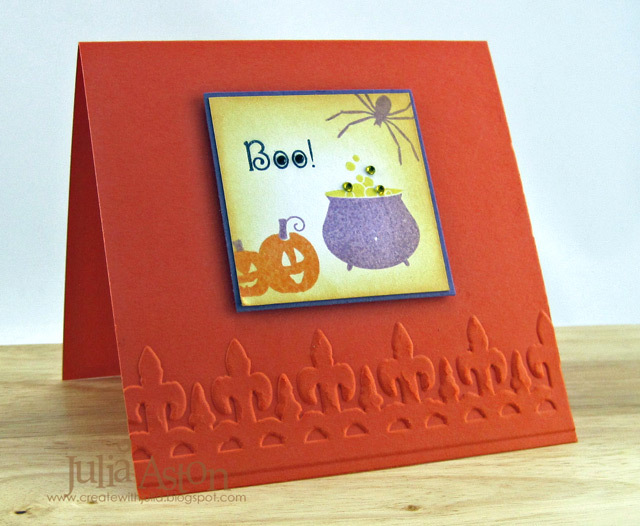 Let's go over there to see all the cards everyone has created in these great fall colors! Happy Sunday everyone! I hope you are having a lovely fall weekend. Here in Massachusetts it has been perfect weather - cool and sunny with the leaves turning and beginning to fall! I made this card for the Inspiration Challenge over on Split Coast. 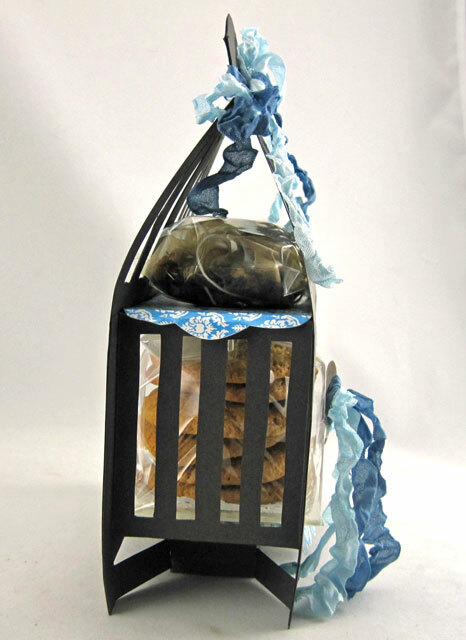 Our inspiration site this week was Pier 1 Imports (I love that store!). This pretty table runner was my inspiration. I knew I would use my favorite Rubbernecker stamp set Fall Trilogy set for my card. Because I wanted to emboss my stems - I first inked them in Versamark and then my color ink, then I clear embossed them. I sponged the background, masking off areas with a piece of computer paper until it was all covered. 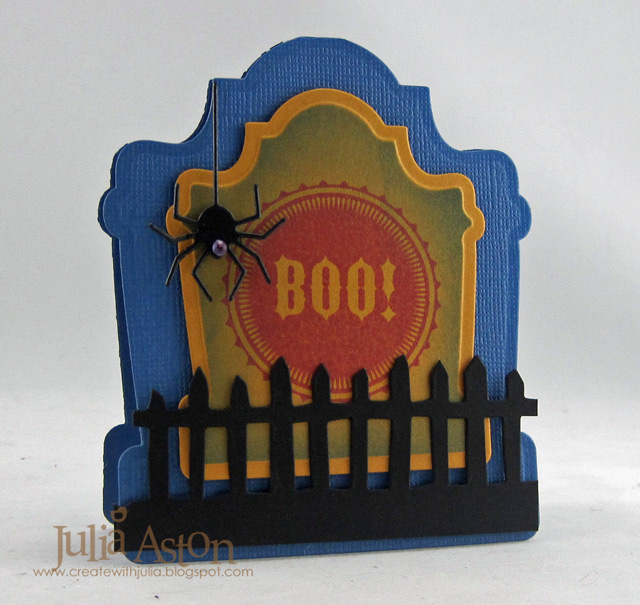 Catch the Bug challenge - a fall meadow inspiration photo. Just a reminder - 10/17 is the Monthly Waltzingmouse Blog Party - it's a color theme this month - check it out here. It's always on my sidebar as well! Hope to see you at the party!! 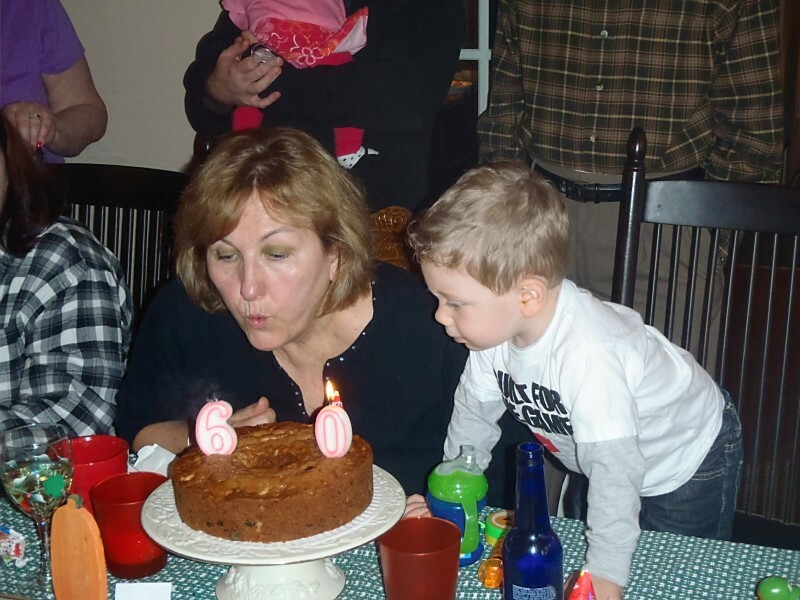 My sister recently hosted my 60th (gasp!) b'day family party. It was a lovely day shared with my son, Josh and his fiance April, my nieces, Chris and Katie, their spouses, 2 sweet toddlers and our new baby, Mila! (and, of course, my sister, Marcia and brother in-law Bob) Poor DH Kent was in the hospital for a couple of days so he couldn't go! He's home and fine now thank goodness! So I wanted to let them know how much I enjoyed the day with them all by making special thank you cards. I had taken lots of candid pictures of the kids so I found two to crop and print for my cards. I sent this card to my sister and her DH, Bob as the hosts. James and Landon (cousins, 9 months apart in age) were happily playing with toys Grandma (my sister) has for them to play with at her house. and here is the inside of the card. 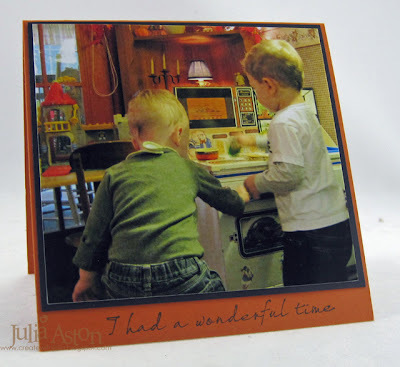 The lovely sentiments are from a set called Join Us by Waltzingmouse. 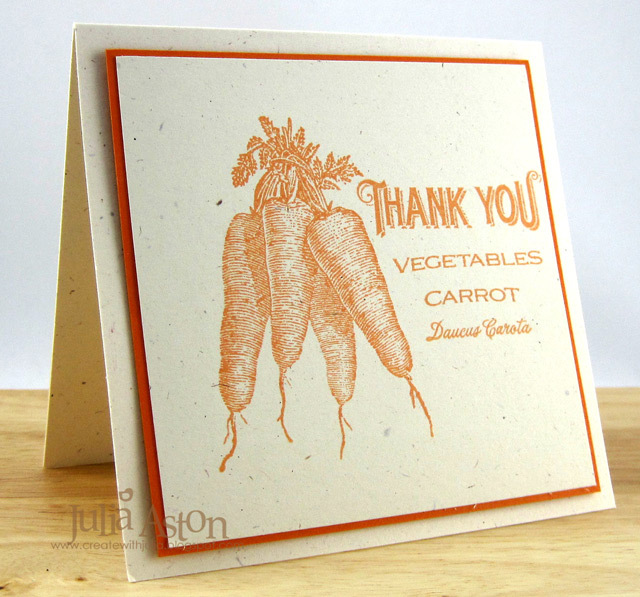 After I photographed the cards, I wrote personal notes to each of them before mailing them off. 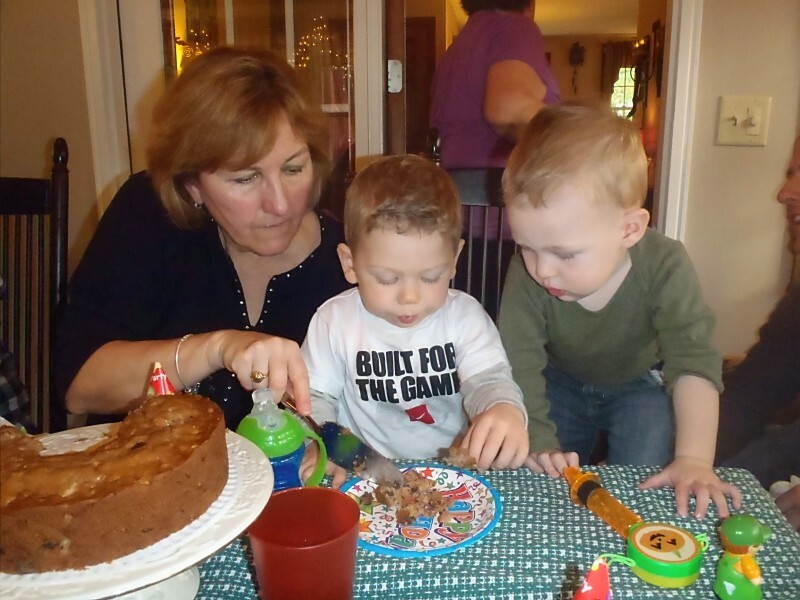 Here's Landon helping his great-aunt Julia blow out the candles. And here I'm cutting up some cake for the boys. Gosh - I'm so thankful for my family! 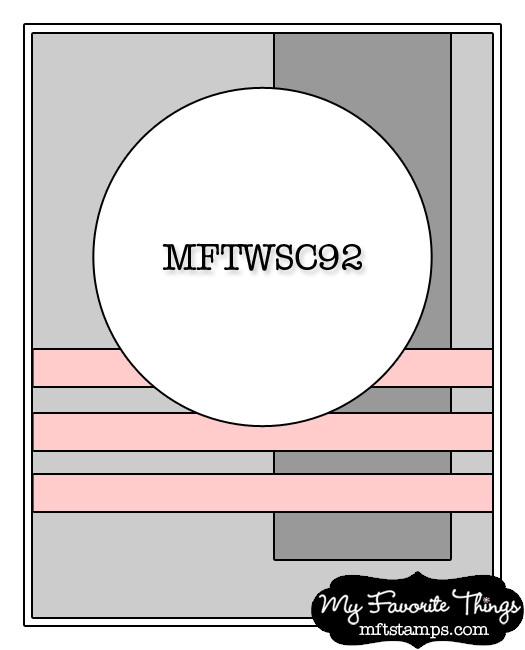 If you're looking for something to do this weekend - check out the Saturday Waltzingmouse Sketch Challenge - the rules have changed - you don't need to use WMS stamps to participate! I used Raspberry Fizz for my pink - along with stamps from Nordic Winter - I love the cross stitched look of this pretty set. These were so easy to stamp - I made 4 of them for my Christmas stash - quick as a wink! On the inside - I stamped the tree from the Nordic set and a sentiment from A Cottage Christmas. 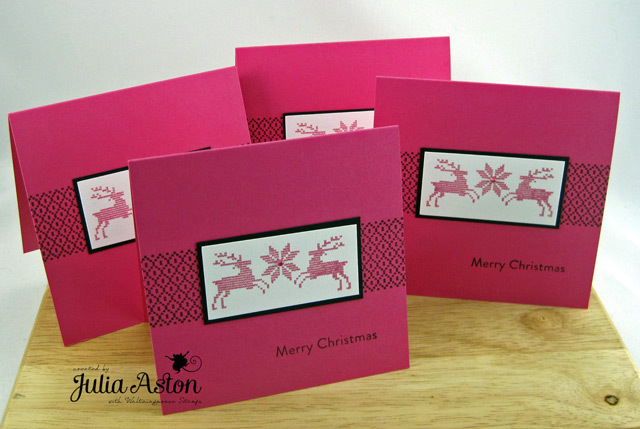 How many Christmas cards have you made so far???? Come along and join us in the Playroom of the WMS Forum and get some done! 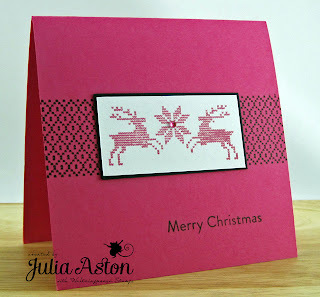 At the suggestion of my stamping friend Stef, I'm also entering this in the October Jingle Belles challenge - Pink! 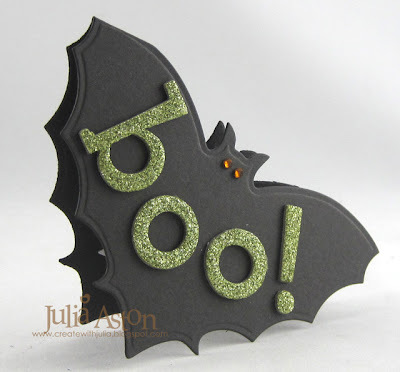 Accessories: Rhinestone - Kaiser Craft. Here are two more cards I've made for the SCS Hope You Can Cling To Challenges. 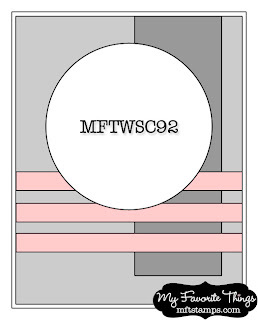 There is a new challenge each day for the month of October and we are sending our cards to the MD Anderson Cancer Center in TX for visitors and patients to use. The challenge for these cards was Courage. 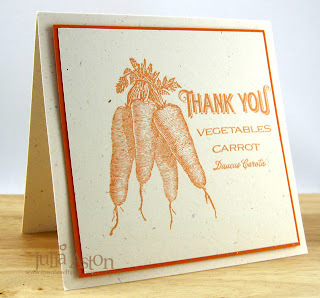 For my first card I used stamps from Back in the Saddle by Waltzingmouse. I can only imagine what kind of courage the patients at the cancer center need to have to face the fight of their lives. 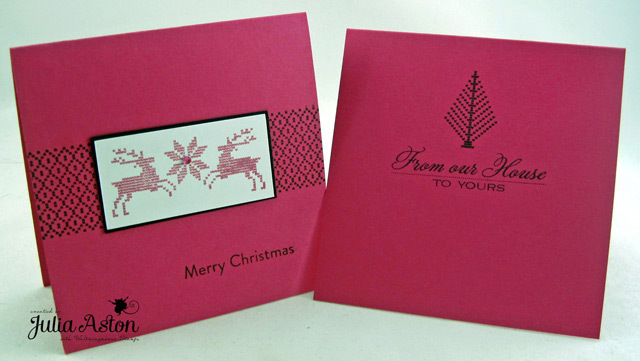 We're hoping our cards will give them a little support. Accessories: crown die - from Heart Wings by Tim Holtz Alterations, circle and big scallop circle Nestabilities, Copic E34. 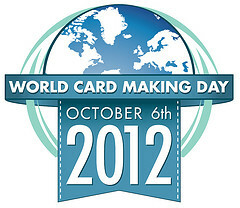 Today I'm excited to be joining with card makers around the world in celebrating World Card Making Day. And what better way to celebrate than by making a card! Our favorite thing to do, right??! 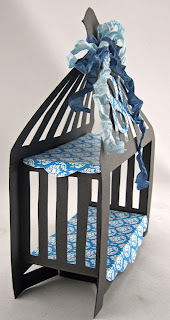 I've linked up to today's Blog Tour with Paper Crafts Magazine - a great way to see lot's of wonderful creations! I love making gift bags and boxes as well as cards so I often incorporate my stamping onto these items. Here I made a set of a gift bag and card - using the same stamp sets on both articles. 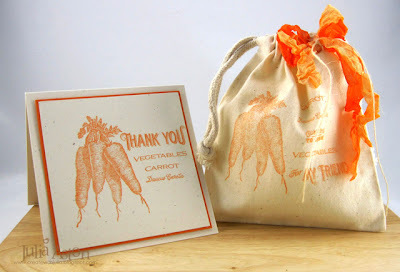 The stamps are from Vintage Garden Seed Packet and Vintage Garden Produce from Waltzingmouse. I tied a bow with two shades of orange wrinkled seam tape, knotted a piece of button twine around the bow and sewed it to the top of the canvas muslin bag with one stitch so it would stay on through openings and closings of the bag! Here it is pulled open so you can see the stampings better! Thanks so much for stopping by - did you make a card today?! Leave me a comment - I'd love to some see it! Stamps: Waltzingmouse - carrot image, carrot, Davcus Carota from Vintage Garden Produce set; Vegetable, For my Friend, Thank You from Vintage Garden Seed Packet set. Accessories: wrinkled seam tape - Prairie Bird Boutique Etsy Shop; twine - Waltzingmouse; canvas muslin bag - Pouch Mart. Another card for The Hope You Can Cling to challenge which was to use strips of something (in reference to how woman have to 'strip' for their mamograms!) - I used 3 ribbons as strips. AND - The Ways to Use It Challenge on SCS was 'what are the odds' - to use an odd number of something - I have 3 ribbons, one boy, one rope, one branch, one sentiment, one circle - Odd enough??!! I wanted to make a boy child card today to send to the Anderson Cancer Center - so I used this sweet boy swinging in the tree from MFT. And he only has a few tufts of hair - which some of them may identify with. 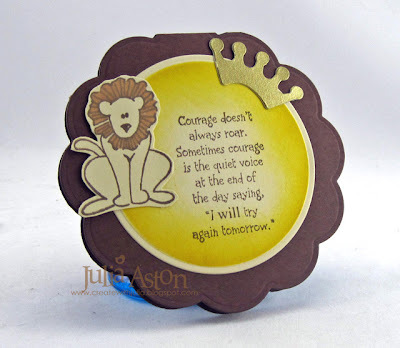 I die cut the image with a circle Nestie and sponged around the edges before taking it out of the die. 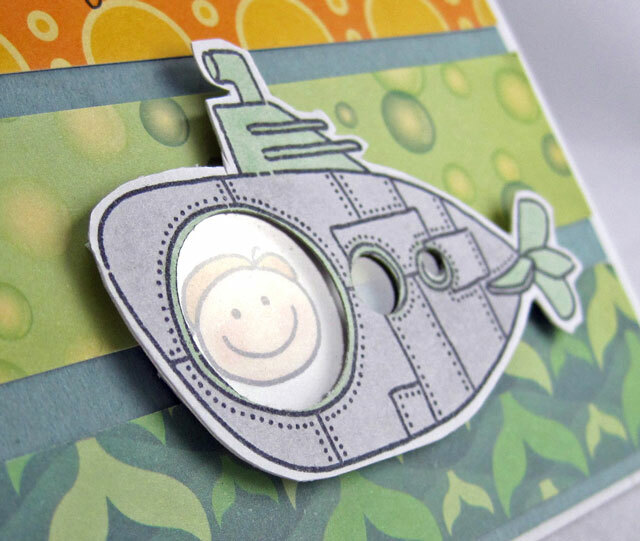 I'll be back Saturday with a card for World Card Making Day! 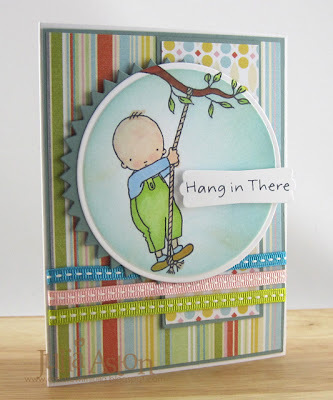 I'm participating in the month long Hope You Can Cling To Challenges over on Split Coast - there is a challenge every day during October and we are sending our cards to UT MD Anderson Cancer Center in TX. Visitors can pick a card out of the baskets they have there to give to patients - and patients can take a card if they need to send one to someone. I'll be sharing some of the cards I make here. Lori's challenge was to make it 'For Kids Sakes'. Waltzingmouse has this great set called Half Pint Heroines with wonderful girl images and affirmative sentiments. I colored this sweet little girl clutching her bunny with Copics and added this sentiment I thought would be quite appropriate for kids at Center. So Tiny! and a Winner!